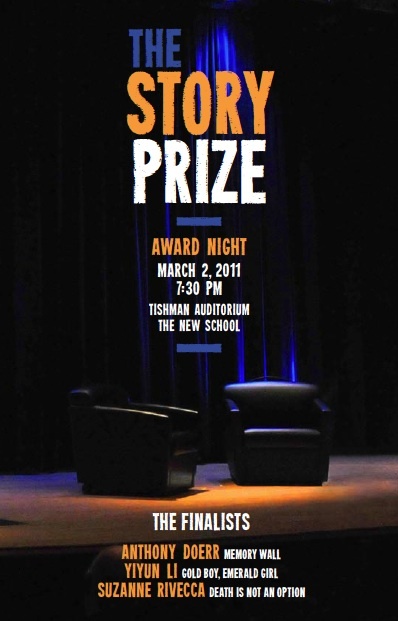 The video for The Story Prize event on March 2 is up on The New School's YouTube page and will soon be on FORA.tv. The director of The New School's graduate writing program, Robert Polito, introduces the evening. 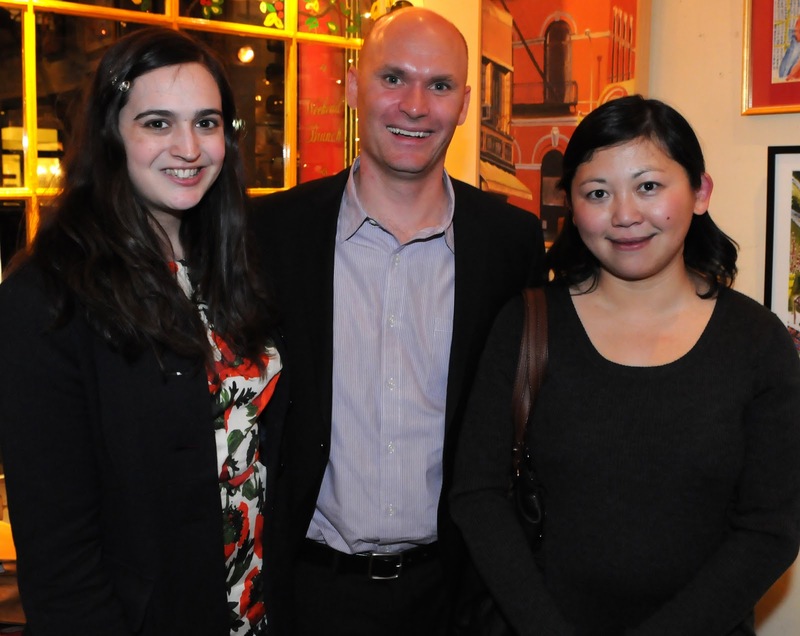 The three finalists—Anthony Doerr, Yiyun Li, and Suzanne Rivecca—read from their work and discuss it onstage with the director of The Story Prize, Larry Dark. The event culminates with the announcement of the winner, Anthony Doerr for Memory Wall, by the founder of The Story Prize, Julie Lindsey. When the three judges for The Story Prize make their choices, they provide citations for the books. This year's judges were bookseller Marie du Vaure, Granta editor John Freeman, and author Jayne Anne Phillips. We include the citations in congratulatory letters we present to each finalist, along with their checks ($20,000 to the winner, $5,000 to the other two finalists). To protect the confidentiality of the judges' votes and the integrity of the process, we don't attribute citations to any particular judge. In deceptively simple prose, Li plumbs the depths of the human soul, managing through her lonely characters to put us in touch with our own yearnings. China is the setting for most of the stories in Gold Boy, Emerald Girl, but they could be happening anywhere, so strong is Li’s empathy for her characters and the universal sense of humanity she conveys. "Kindness," the long story that begins the collection, sets the tone for the entire book presenting a seemingly uneventful life that hones in on the utterly gripping interior drama of its narrator. Each story that follows opens gently like a flower and ends—to our astonishment—in full bloom. Li’s fine and careful work shows that simple can be profound and depth of feeling trumps elaborate machinations. To be so wonderfully in control and yet so keenly attuned to emotion is a rare gift indeed. Suzanne Rivecca's stories are truly “illuminated lamentations . . . testimonies of harm” that continually startle and surprise. These stories of female sensibility speak to our times with ironic, brilliant strength, their voices linked by a young writer's empathetic genius. Rivecca's unhappy, discerning, always inquiring protagonists journey to various hearts of darkness, crossing cultural, religious, sexual, and generational boundaries with wit and angelic rage. Each seems a soul pulsing with linguistic energy and exhilarating intelligence. Rivecca reminds us that we are all connected, similar to our very molecules and erratic genes, inextricably bound by desire, shame, guilt, and ecstatic possibility. Death Is Not an Option becomes an impassioned directive about how to read, how to write, and how to live. Thanks to all. We'll update this list as we learn of more. Anthony Doerr’s incandescent collection of stories is a poignant elaboration on the idea of how memory affects the course of our lives, and how it acts as the true portal to our own selves. Each story is a tribute to the irrepressible need of humans to draw on remembrance in order to shape their future. When confronted with the alienating pain of loss or disappointment, the protagonists compensate for that void in projecting their recollections of that experience onto the canvas of their new daily reality. As such, and through the solicitous and careful artistry of the writer, these characters are able to recreate a stronger self, and they move on through a last reshaping process, even if that means facing their very own end and erasure. It is the shimmering space between the two planes of reality and memory that Doerr captures with immense sensitivity. Doerr is adept at evoking a variety of places and different times in history, conjuring sharp settings in which the fragility of his characters is played out. The diversity of backgrounds underscores his poetic skill at illustrating his themes of emotional distancing and the resilience of hope. While he displays a rare imagination in the handling of his subjects, he maintains a beautiful and quiet grace in his precise, spare style, providing a harmonious resonance to all of the stories. Memory Wall is an astonishing work that bears the signature of a writer of remarkable talent and impressive maturity. It leaves the reader deeply moved and carrying the indelible impression of having witnessed compassion in the making. 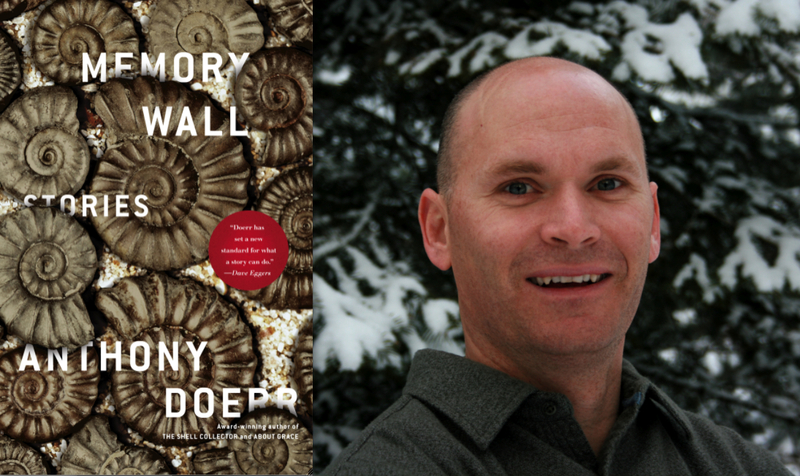 Anthony Doerr has long been fascinated with the natural world. He has a botanist’s broad vocabulary, a trail guide’s solo instincts. But there has always been a division – especially in his fine and very funny book on trying (and failing) to write in Italy, Four Seasons in Rome, between our lives, and the lives of, say, crustaceans. As if the natural world were out there, fleetingly glimpsed, constantly being pushed aside by the so-called everyday world. Doerr has finally broken down that boundary with this extraordinary collection of stories, Memory Wall. It is the work of a writer who has absorbed the natural world so deeply he can write with its metaphors. Or to put it another way: this book creates its own ecology. Instead of water, there is longing, and instead of air, there is memory. Within these parameters, Doerr unspools the lives of men and women who are haunted by the past’s proximity. In the brilliant title novella, a woman in South Africa undergoes a dangerous procedure which allows her failing memories to be restored to their original state in replayable cartridges—only to have them stolen. Other stories take place in Estonia, Germany, Korea, and Wyoming, as if Doerr is making a political point that not only are our memories ourselves, they are the bedrock in which nations plant their strongest roots. The heroes of these stories are equally wide-ranging—from Holocaust survivors to a storied sturgeon which reappears, long after people assumed it was dead. They all stand before the same existential dread – erasure, and the vanishing of memory. “Every hour,” Doerr writes in “Afterworld,” “all over the globe, an infinite number of memories disappear, whole glowing atlases dragged into graves. This astonishing collection identifies what needs to be preserved. And brings us right to the water’s edge, where the sand bags are being put down. We endeavor to make The Story Prize event a celebration of the short story form, and the three finalists—Anthony Doerr, Yiyun Li, and Suzanne Rivecca—were totally in the spirit of that yesterday. Even though one person is ultimately singled out, our intention is to honor all three authors equally until the moment of that announcement. Tony, Yiyun, and Suzanne were extraordinarily gracious and forthcoming in discussing their work. And all were great fun earlier in the day and at the reception afterwards, as well as being congenial and supportive of one another, as the photo above shows. They also had a lot of interesting things to say. Anthony Doerr, for instance, in answer to a question about the preponderance of older women in Memory Wall, talked about how his grandmother, who had Alzheimer's disease, came to live with his family when he was in high school and how, in his teenage self-absorption, he had been somewhat oblivious to her condition. Yiyun Li discussed how her characters stubbornly resist being swept along by the tide of history—even though that often results in loneliness and isolation rather than the easy gratification and happiness that conformity can bring. And Suzanne Rivecca revealed how a PBS show about Walt Whitman's first-hand experience of slavery when he traveled to New Orleans in 1848 and a trip her father had taken to the South in the 1960s, together spurred her to write a novel about Whitman's sojourn. Thank you again, Tony, Yiyun, and Suzanne!